A blue hydrangea that bloomed until a few days ago. Blue hydrangeas. They are my favorite flower and have been as far back as I can remember. I’m not sure if it was because I saw them in Martha’s Vineyard and they were so plentiful near the water, but the image of seeing them as the ferry neared the island has always stuck with me. Blue hydrangeas. They were my wedding flower. When I found a wedding invitation that had a single one on the cover, I thought it was–I don’t know the word, kismet? The invitation was simple yet elegant, just like the flower itself. It wasn’t hard to figure out which flower my bridesmaids would carry, with a white one for me. I was never one to be showy, so they suited me just fine. And the fact that they were not nearly as expensive as some of the other variations I could pick for our bouquets only made it seem like it was that much more meant to be. Before my wedding, I was told the day would fly by in a blur and I might not remember all the details. So, I tried to take mental snapshots during the day. My ceremony was a simple one, one which lasted all of 11 minutes. I was too busy looking at my then-to-be husband to notice the beautiful arch my florist had put together, with, of course, blue hydrangeas as the main flower. So that evening, after everyone had left the reception hall, but before we left to go to the hotel, I ran outside. It was about midnight and still ungodly hot (my wedding was in August and it had been about 95+ and humid that day.) I just wanted to stare at that arch of flowers and preserve that memory of those flowers. My flowers. An arch that had been decorated just for me. And it’s a good thing because I don’t remember seeing that many pictures of it afterward. Blue hydrangeas. The mophead ones, like the one pictured above, are the ones I have always had trouble growing. The lace-cap ones, no problem. But the mophead ones, well, I was lucky if I got a single bloom or two on the Blue Nikko plant I bought the summer after we bought a house. I could never figure out if it was one on which you cut the old growth or the new growth, in the spring or fall, to encourage it to come back even stronger the next year. I took this photo on the right, just a few days ago. What you need to know about blue hydrangeas in the Northeast is that they usually begin to bloom in June. So, to have one survive as long as it has, with our fluctuating temperatures which have gone as low as the low 30s over the past week, is pretty amazing. I was sad to see this bloom has finally succumbed to the cooler weather, but I know it will the plant will come back next year. I know it will be strong and beautiful. Associations or memories can overwhelm you if you let them. I could let these beautiful flowers make me unbearably sad if I wanted to, but I choose for that to not be the case. I choose to allow that memory enter my mind only briefly but when it does, to remember how happy I was that day in August 2004. I choose to focus on the simple yet elegant beauty of the bloom. And to elicit thoughts and associations with the beach, with Cape Cod and Martha’s Vineyard, where life seems to move at a slower pace. To elicit thoughts and associations that make me feel at peace. To elicit thoughts of my dream life with my small or tiny house near the ocean. I make a conscious effort to concentrate on their beauty and my future. Because that’s what you have to do – only you can choose to either feel sad or hopeful or happy. No one can do it for you. The mind is an incredible things that can affect the way you look at the world, so much. Are there any images that evoke thoughts or memories in your mind in such a way as I have described above? Please leave me a comment below if you have some, and I will be sure to respond. ** Both of these photos were edited with a free iPhone tool called Snapseed, which I learned about in my digital photography course, Everyday Magic. Do you know the real hydrangea magic? They are either blue or pink depending on the acidity of the soil. 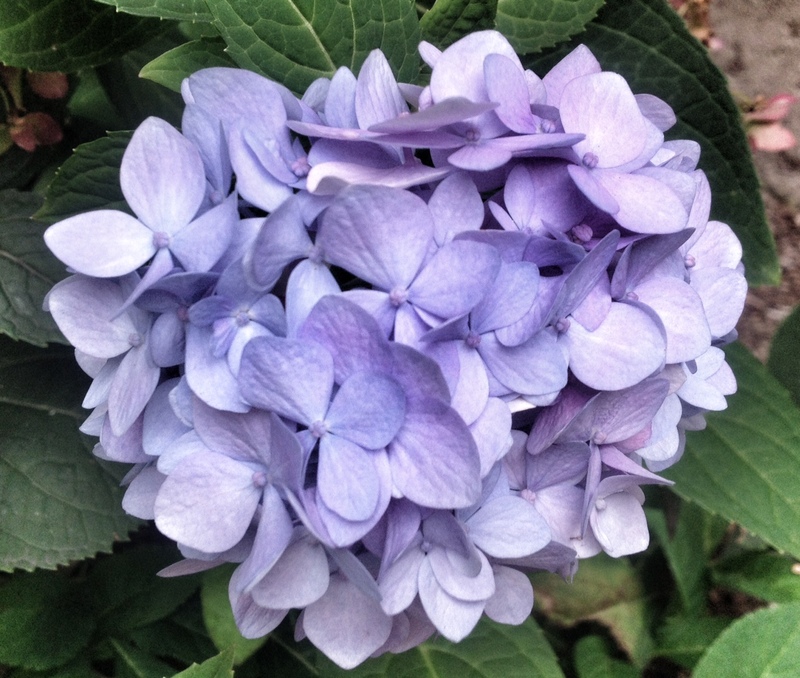 When I lived in the suburbs, one of the first plants I bought were hydrangeas. i bought them from Martha Stewart’s website. The first season they bloomed an unearthly purple. It must have been because they were raised in alkaline soil (pink) and transplanted in my yard to acidic soil (blue). The next summer they were cobalt blue. People stopped to take pictures of them. By the time I was ready to leave that life, they had settled down to a sky blue. And yes, I was saddened when the old hydrangeas were ripped out. 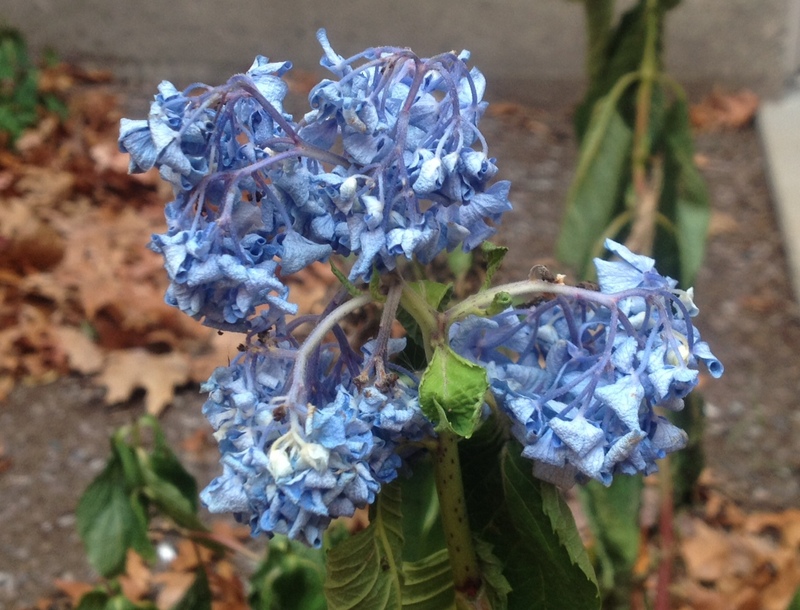 But on the side of 1960, there is an hydrangea with the most intense blue I’ve ever seen. It is really amazing. And Esme, my little future stepdaughter, took home a dried-out blue blossom this past Sunday. On the side of 1980 there are some huge creamy pink blossoms which I will probably keep in my vases all winter. Yes, they are amazing . What i did to keep mine healthy was to cut them way back every fall. I will have to look for that plant next summer then, as Osito and I usually don’t end up walking over to that side of the building. I just couldn’t believe they would get rid of those plants!! Yep, that’s why so many of them down on the Cape are blue as compared to other places. I just remember how mine always used to wilt in the heat and then come back with a vengeance as soon as I drowned them with water. I don’t think I have heard of them, but am going to check them out. They wouldn’t be located on the main street/drag in Chatham, would they? I will also check out your novel, thanks! Also, thank you for taking the time to comment on my blog. That was very kind of you! You’re welcome, and no, they are not in downtown Catham but on route 28 as you enter town. Enjoy the book! Thanks for checking it out.